It’s finally time to reveal what I have been working on for the last few months!! Yes I did just totally say MONTHS!!! In my perfect world this would have only taken a few weeks/weekends…but with Miss K running around during the day and running my mom’s business while she was on vacation….my kitchen took a back seat for a little while. I only worked on it on the weekends, at night and…well here we are finally finished with the walls in the kitchen!! Here’s a little back story on our home. When we first bought our home in 2005, at the very young age of 19, neither of us new a thing about being a home owner. We just new we had bought a house and we were happy to be on our own! The walls were all white…blah. So I started painting everything! I have never been great at picking out paint colors. Every paint color has always turned out to be a different color on my walls than I pictured. The kitchen was no exception. I didn’t mind the green though, I actually liked it..for a while. Though the years I pondered over what to paint it next and never really came up with anything that I thought I could stick with. Then painting and decorating my kiddo’s rooms became a larger priority over the kitchen. 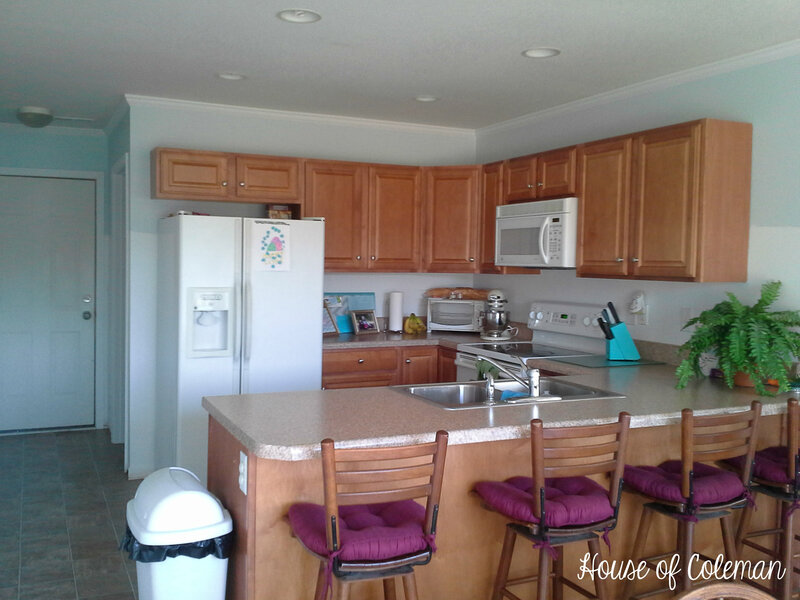 When I was finally satisfied with their rooms I started thinking about the kitchen again and here we are now! I’m an avid user of Pinterest and found a few ideas that I wanted to do in the kitchen! I knew I wanted Board and Batten on the walls as soon as I saw this tutorial! 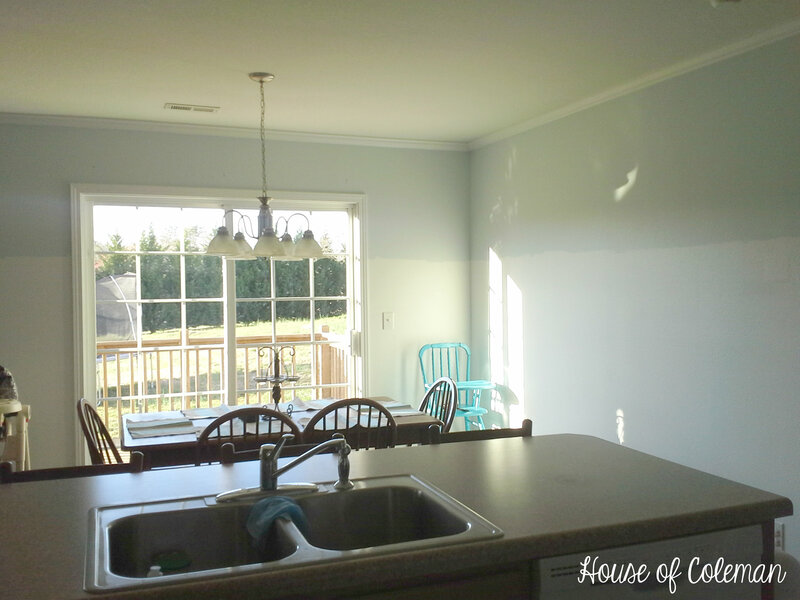 Love this shade blue…knew that I wanted something similar in the kitchen! As soon as I had my ideas, it was off to Lowes to get my paint first! The paint I chose was Valspar Satin Rising Tide (4008-3A) and it now comes with paint & primer in one…awesome….saved me a step! As soon as I got home and put Miss K down for the night I was painting the walls in no time (and cleaning up all the clutter!). And there you have it. Part 1 of the Kitchen Wall Makeover! 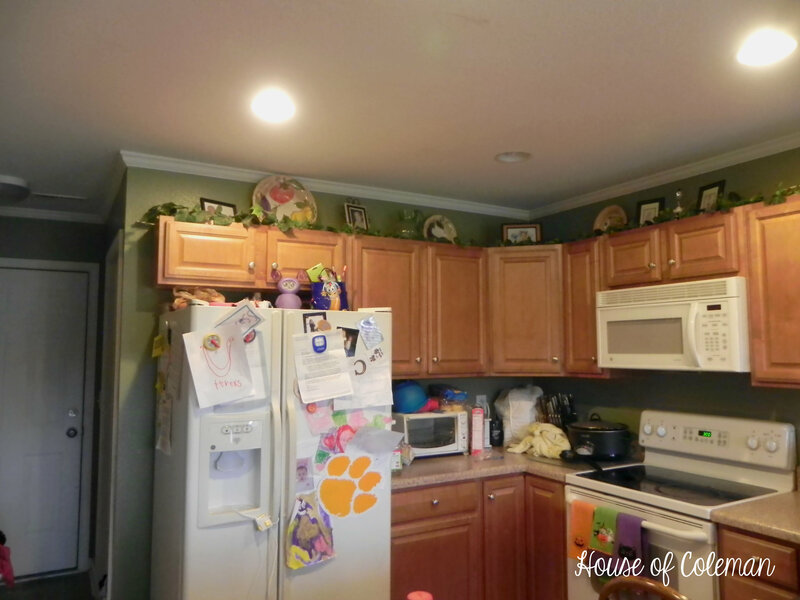 I absolutely LOVE the change that just the paint made in the kitchen! It’s much brighter, lighter, and feels bigger! Now if I could just talk the hubs into letting me paint the cabinets I will be on cloud 9! 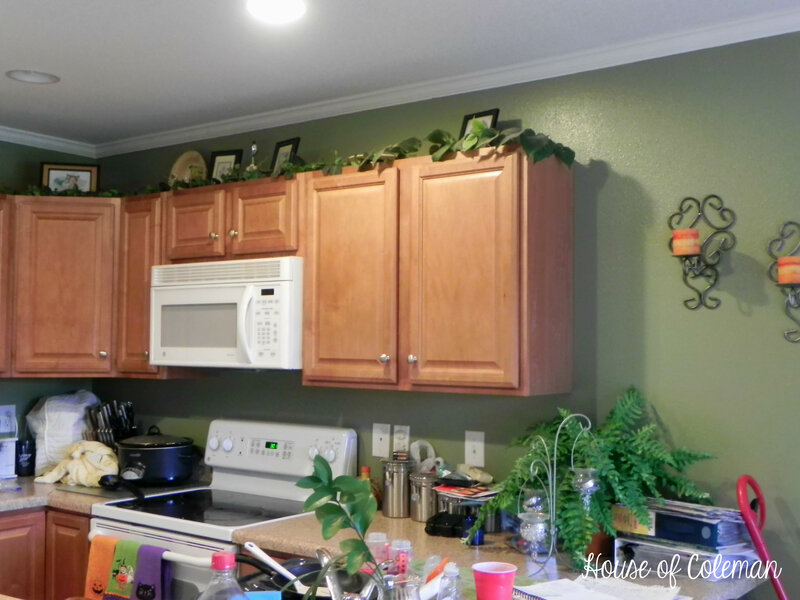 Check back in a few days for Part 2 of the Kitchen Wall Makeover….Adding the “board and batten”!! What a great start for a beautiful kitchen! I did a board and batten bedroom on a post, it’s a little simpler in style than your inspiration picture. It really changes up a room without too much expense. Looking forward to seeing part 2. Thank you! I took a look at your post, I really love what you did to that room! I love that it is a more simple style of board and batten but yet still such a big difference it made in your room! I scanned over some of your more recent posts and really love your style! I will be following your blog as well to see what you post next! Thanks again! Well thanks for following! Your kitchen will look great with any B and B you choose. Looking forward to seeing what you end up doing. And if I can help at all, let me know.